Is Jason X available for hire? I only ask, you know, because as I ponder this weekend's new movie offerings, I keep thinking that someone ought to pay the scheduling geniuses responsible for this weekend's yawn-inspiring slate "a little visit." And since Mel Gibson and Homer Simpson have proven to us that there's no sense matching wits with studio executives, the only sure way to prevent travesties on a par with the simultaneous release of Life or Something Like It and the tenth installment of the Friday the 13th films is through sheer brute force. I'd consider sending the Green Goblin, but he actually looks lamer than the upgraded Jason (if that's possible), resembling nothing so much as a GoBot gone bad. So, while we wait for Studio Executive A to hand Mr. Voorhees his machete, let's take a look at the horrors that await moviegoers this weekend. Our first new release of the weekend is the Angelina Jolie flick where Antonio from Wings tells her that she is going to die in a week, so she'd better do something about her horrible, old-timey blonde hairdo, and quickly. She enlists Ed Burns to help her in this quest while apparently dissing the wonderful Christian Kane (if you didn't catch his magnificent heel turn as Lindsay McDonald on Angel, shame on you). Our tattoo-covered and knife-collecting heroine has had a spotty box office history. As we can see by examining the above chart, Mrs. Billy Bob Thornton has had some degree of success in action flicks and thrillers. She's never truly top-lined a comedy before, so she's treading untested waters with her turn as a shallow television reporter in the process of re-evaluating her life. Unfortunately, the trailers and the scant television ads don't really seem to be generating much interest. Debuting at 2,604 venues, Life or Something Like It is a long shot to top $10 million, particularly given the lackluster performance of The Sweetest Thing, this month's previous female-targeted comedy with a big-name star. My best estimate is for a weekend total of $8.5 million. Since films one through nine in the Friday the 13th series simply didn't give us enough of an in-depth character study of Jason Voorhees, New Line has seen fit to unleash a new brand of terror on unfortunate film audiences. Evil may have gotten an upgrade, but the only true reason any self-respecting horror movie fan would deign to see this film is for the humor, which is admittedly present in both trailers and TV spots. At least they're not really taking themselves too seriously. But it's not like it hasn't been done before. Plenty of the early slasher franchises, including this very series, have had recent installments that have seen varying degrees of success. 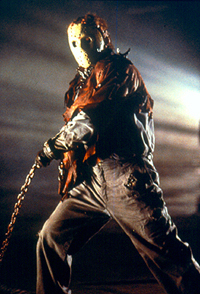 Though the hockey mask-wearing psychopath is pretty clearly the least successful of the creepy entourage, Jason X does appear to have a few things going for it. The advertising for the film has been practically ubiquitous in its target demographic, with spots appearing almost constantly on networks like MTV, UPN and the WB. Additionally, banner and skyscraper ads can be found on an exceptionally large number of entertainment-focused Web sites, with a number of them offering the option to click directly over to the trailer (though maybe that's not exactly a good thing). Unfortunately for Mr. X ("hmm, shall I cross the final frontier? "), the film is not receiving strong support from the studio, as it is being shown in only 1,878 venues. Probably the best-case scenario would put Jason X's opening at the inflation-adjusted level of the film billed as "the Final Friday" back in 1993, which would give us a weekend tally of just under $10 million. Since we haven't had a (*cough*) "re-inventing" of a slasher film since the two rather successful ones back in 1998, we may be looking at surprising numbers for Mr. Voorhees. Since I was thinking $6 million was a fair amount before I started examining past box-office results, I'm going to split the difference and say the New Line release has a strong chance at a $9 million weekend. Either way, one thing is certain. The Rock will be the box-office champion for a second week, though he will obviously forfeit the title to a web-slinging nerd next weekend. Excuse me while I go weep for society.